Radishes are multicolored root crops that are easy to grow and pickle. They exhibit sweet and peppery flavors that add an excellent punch in dips, sandwiches, salads, and steak dishes. Plus, they have many variations that can be grown and harvested seasonally or even year-round in many locations. In making pickled radishes, the type of radish must be considered. There are long and short radishes, hued in pinks, whites, blacks, and reds, seed pod and peppery bulb shapes. Giving some radishes a quick skinning can remove sand and dirt that may cling onto the skin. It's always best to wash the radishes carefully before pickling them. For regular round radishes, peeling is not required. There are many different flavoring components you can add to your radish pickles. These may consist of fresh dill sprigs, bay leaf, peppercorns, garlic, chili peppers or a variety of herbs to enhance the radish flavor. Radishes have high potassium, calcium, and iron levels. The potassium found in a radish is thought to aid digestion and lower blood pressure. Trim and discard the radish leaves. Often these are thrown away but they can also be used as bitter greens and sauteed, used in salads or dressings, or even pickled themselves. Pickling radishes uses the same process as pickling cucumbers. To start with the pickling process, wash the radishes and cut off their root tips. Next, slice the radishes. You can cut them thick or thin, whatever your preference is. Prepare any additional ingredients you will be adding such as onion, peppers, or garlic. Add all the ingredients into jars. Make the pickling solution. It is often a combination of vinegar and flavoring ingredients such as salt, sugar, and other spices. Bring the pickling solution a boil and mix well. 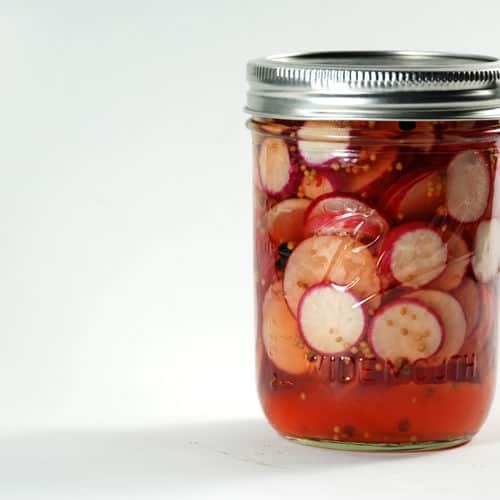 Remove the pickling solution from the heat and pour it into the jars filled with radishes. Leave about 1/2" at the top of the jar. Seal the jars. If you are canning the radishes you would now process the jars in a water bath for 15 to 30 minutes, depending on the size of the jars. Once the jars are processed they can be stored in the cabinet for up to a year. The pickled radishes will typically be ready to eat after a day but the longer they remain in the liquid the more flavorful they will become.